Helps you to solve D-Link network problems. How do I configure D-Link DSR Series router for a Static IP Internet Connection? Why can”t I see my D-Link camera video in D-View Cam? How do I install my D-Link DCS-8xxxLH-series camera? How do I install my D-Link DCS-8525LH-series Night Camera? How do I configure Captive Portal on my D-Link DSR Series Router? How do I enable the loopback Detection for D-Link DGS-1500 switch? How to update firmware for ASUS Model WL-700ge Wireless Router? How to set up a reliable Mesh WiFi system in 780m2 ball room using ASUS Products? How to set up Time Machine on ASUS RT-AC3200? Fabrizio Salani on How to install mydlink services plug-in on Safari? Laernm laso on Why won’t my VoIP device work with D-Link router? canon printer error 6a00 on How to set up and install my D-Link router DIR-816L? How do I configure the WLAN Partition on my D-Link DWL-2100AP? The DWL-2100AP allows you to select whether or not either wireless band can pass information, via the Internal Station Connection option. If this feature is not enabled, that particular wireless band will not be able to pass any information through the Access Point. This feature effectively segregates the wireless band of your choice from the rest of the Network. With Ethernet-to-WLAN Access disabled, information sent from the Ethernet side will not be passed to the Wireless Clients. However, wireless clients will still be able to transmit across Ethernet for browsing, etc. Step 1 Open your web browser such as Internet Explorer and enter the IP address of the DWL-2100AP in the Address bar and press Enter. The default IP address is 192.168.0.50. Step 2 Enter your username (admin) and your password (leave blank by default). Click OK. Step 3 Select the Advanced tab and then click Filters on the left side. Step 4 Click on WLAN Partition. Step 5 There are 2 different filters you can use to control traffic on your network. Select Enabled from the corresponding drop down box to enable the feature. Enabled – this will allow wireless clients to communicate with each other (within the same wireless band). Disabled – wireless clients are not allowed to exchange data with each other (within the same wireless band). Enabled – Ethernet devices can exchange data with wireless devices using the Access Point. Disabled – Ethernet devices are not allowed to send data to wireless devices associated with the Access Point. However, wireless devices can still send data to the Ethernet devices. 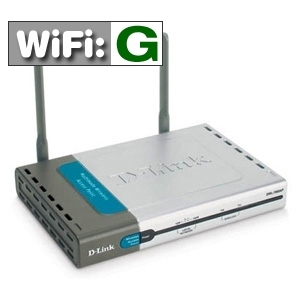 How to enable WEP Encryption on D-Link DWL-2100AP,DWL-2200AP, or DWL-7100AP? Step 1 Log into the web-based configuration by opening up a web browser and typing in the IP address of the access point (192.168.0.50). Step 2 The default username is admin (all lower case) and the password is blank (nothing). Click OK. Step 3 Click on the Advanced tab and then click Encryption on the left side. Select the Wireless Band (DWL-7100AP only). Step 4 Click the radio button next to Shared Key and then click Enabled next to Encryption. Make sure your other wireless devices are set to Shared Key. Step 5 Next to Key Type, select HEX or ASCII. You will need to use the same key on all your wireless devices. HEX – use 0-9 and A-F only. ASCII – All numbers and letters.Step 6 Next to Key Size, select the level of encryption (64, 128, or 152-bit). Step 7 You can enter up to 4 different keys. Select the key you want to use from the Valid Key drop-down. Step 8 Enter your encryption key. You make this up yourself. If you selected HEX, then enter a key made up of a combination of numbers (0-9) and letters (A-F). For example – A4572BCC19 (HEX). Step 9 Click Apply to save settings. Note: If you are configuring your access point from a wireless adapter, you will lose connectivity as soon as you click Apply. 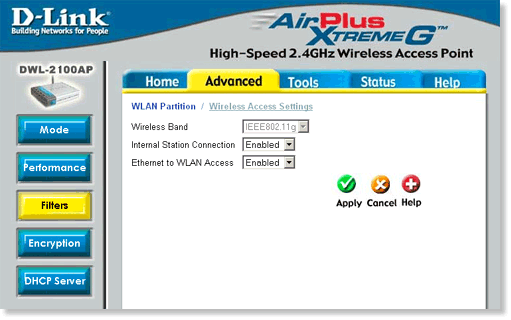 You must enable WEP on your adapter and enter the same exact key as you entered on your access point. How to change username and password on my D-Link DWL-2100AP,DWL-2200AP,or DWL-7100AP? You can change the user name and password within the web-based configuration utility that is built-in to the access point. Step 1: Open your web browser such as Internet Explorer. Enter the IP address of the D-Link access point (default is 192.168.0.50) and press Enter. Step 2: Enter your username (admin) and your password (leave blank by default). Click OK. Step 3: Click on the Tools tab at the top and then click Admin. Step 4: Enter your new user name and then enter the old password (if any). Enter your new password and click Apply. After the access point restarts, you will be required to enter your new user name and password. How to configure static pool settings on D-Link access point DWL-2100AP? 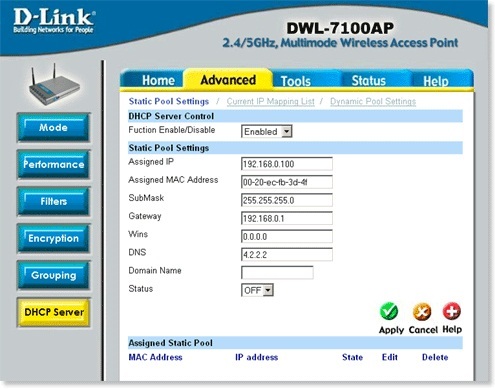 This FAQ is for the D-Link DWL-2100AP and DWL-7100AP access points. Step 1: Open a web browser and type the IP address of the access point in the address bar (default is 192.168.0.50). Press Enter. Step 2: The default username is admin (all lower case) and the default password is blank (nothing). Click OK. Step 3: Click the Advanced tab and then click DHCP Server. Step 4: Click Static Pool Settings. Step 5: By default this feature is disabled. To enable it select Enabled from the drop-down list next to Function Disable/Enable. Step 6: Enter the IP address that you want to assign to the device in the text box next to Assigned IP. Enter the device´s MAC address in the text box next to Assigned MAC Address. Also, input the Subnet Mask and Gateway. All other fields are optional. Step 7: Click Apply and then click Continue to save the settings. How to enable MAC address filter on D-Link DWL-2100AP, DWL-2200AP, or DWL-7100AP? Step 2: Click the Advanced tab and then click Mac Filters on the left side. Step 3: Next to Access Control, select the mode you would like to use from the drop-down menu. Disabled – Disables this feature and will allow all wireless clients to connect. Accept – Blocks all clients except for what you enter in the list. Reject – Allows all clients except for what you enter in the list. Step 4 Enter the Ethernet MAC address that you wish to Accept or Reject. Step 5 Click Apply and then click Continue to save your settings.